Taieri Times / Otago Daily Times fails to understand or elaborate (no research!) the issues raised by local resident and business owner Brian Miller in his submission to the Transportation section of the proposed 2GP. 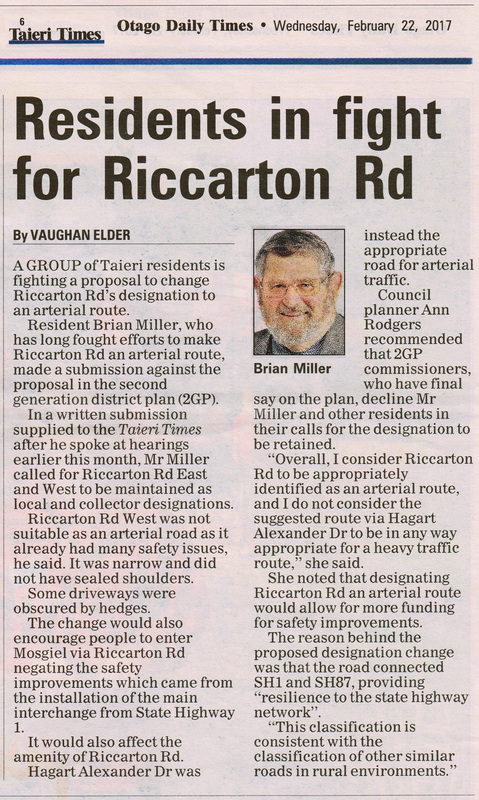 Mr Miller and his family have lived on Riccarton Rd for the last thirty years. In that time, variously, DCC have planned – and carried out supporting construction works – to enable Hagart-Alexander Dr (HAD) as an arterial route taking heavy vehicles ‘safely’; DCC have been to Environment Court on the matter, receiving clear rulings and sets of conditions bringing about these construction works; since then, however, DCC have formed the view – contrary to the Court rulings and agreed structure plans – that the arterial route should be Riccarton Rd, not HAD. 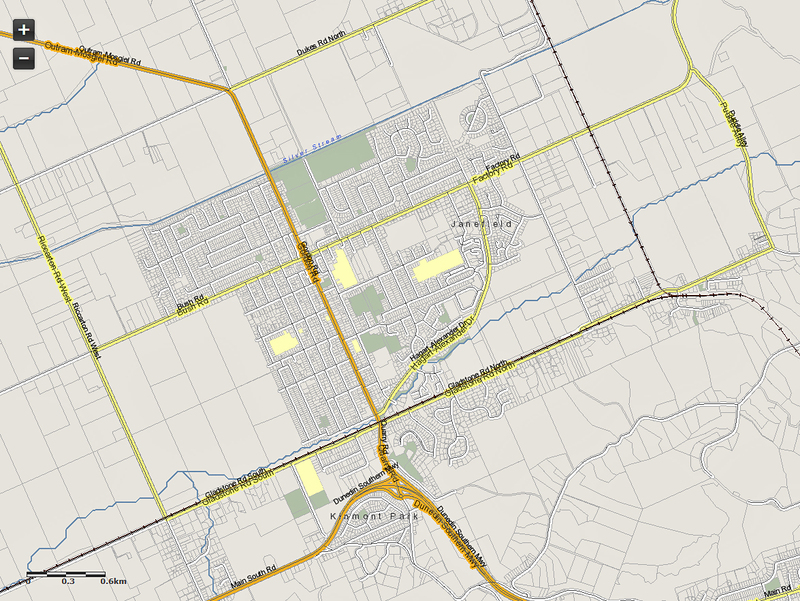 Former city councillor and deputy mayor Sydney Brown has a residential subdivision to HAD. Who is pulling whose chain here ? DCC, in changing your minds, where is the due (fair and proper) process of public consultation ? Are flicks of the pen all that DCC does now. The Sin : City Planning, in its 2GP recommendations for the Taieri roading hierarchy fails to acknowledge legal determinations of the Environment Court of New Zealand and insodoing the council may be seen as INJUDICIOUS. Court rulings cannot be ignored holus-bolus to suit DCC fairyland futures for the Taieri. Further, to underline…. during the ‘Revised Planner’s Recommendations’ on February 10, the city planner was heard to say they regarded information presented in submission(s) as “old” – the strong inference being that Environment Court rulings do not count; or worse, that they had no idea any matters had, in fact, been to court. The City thus appears sunk on a problem of integrity, lawful or otherwise. This situation simply would not arise if greater supervision and TRAINING was provided to salaried council underlings involved in 2GP processes. They must be fully cognisant of the history and implications of relevant legal rulings made in respect of council activities. That way they could see the trees for the wood when the likes of ex staff appear for ‘advice’ to hearing in trite bouncy-rat mode. Lastly, in god we trust…. the independent commissioners Messrs Collins and Rae are NO FOOLS. We The People will see you in Court. Note: Brian Miller gave his family trust’s 28-page submission (plus attachments) on the 2GP Transportation topic in the hearing of independent commissioners David Collins and Gary Rae, only. 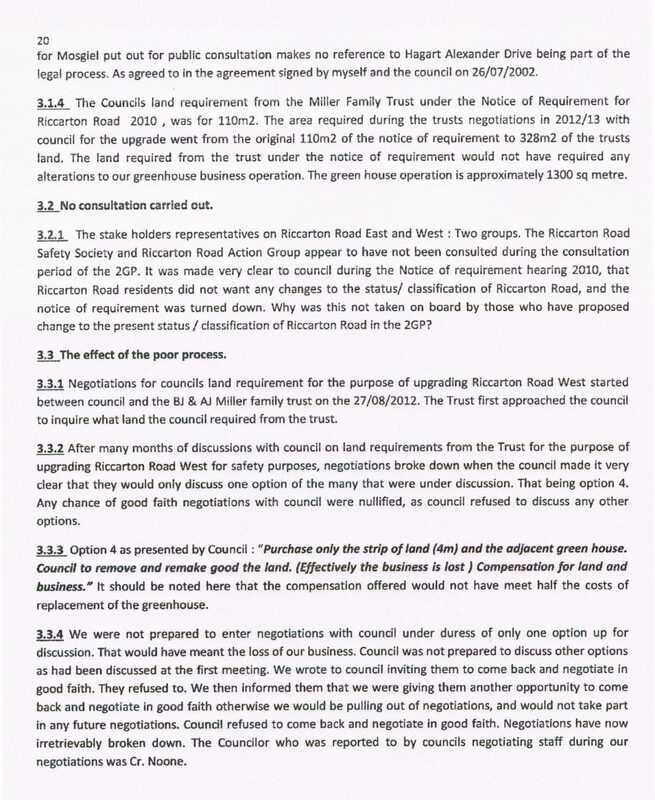 To avoid conflicts of interest, at Mr Miller’s request and with the Chair’s agreement, no councillor commissioners were present for the submission. Disclaimer. The site owner is not responsible for the currency or accuracy of content of this post and the inclusion of the information provided does not imply endorsement by the site owner. Sun, 5 Feb 2017 at 12:19 a.m. In politics, just as in war, the first casualties are usually the truth. This is no better illustrated than in the issues that have, over many decades; washed around Hagart-Alexander Drive, Mosgiel. The culture of dishonest comment that has characterised these issues is so extensive that it cannot be illustrated by thumbnail sketch, and though the temptation to condense this summary is real, the principles that represent the truth must never be compromised. Thus I crave your indulgence by presenting some facts that this DCC Transportation Report has not revealed to you. Some sixty years ago when the Mosgiel Borough Council bordered the Taieri County Council, the collective ‘wise heads’ of those two Authorities opined that with a developing industrial activity in North Taieri there would be a future need to divert nuisance industrial traffic from Mosgiel mainstreet. While it must have seemed an impossible task, they managed a herculean (east side) land purchase corridor from Gordon Rd to the Silverstream. This must have been no mean feat to have had to deal with maybe scores of property owners. The wisdom of these pioneers did not end there; they pegged that corridor so that nobody should be in any doubt as to the Authorities’ intentions. Not surprisingly the value of land bounding this corridor plummeted (who would want to own property next to an industrial traffic by-pass). But in the minds of the punters, the plan for this road was away in the future, and with the passage of time it became widely believed that it wasn’t going to happen and the Real Estate fraternity in particular perpetuated this mischief. Ignorance abounded and was so profound that it is said that in one case a bounding property owner (when building) sought planning departure to have his building platform set back to allow a greater recreational frontage. It mattered not that this robbed his backyard space; he had a whole roading corridor behind him; upon which he apparently built a tennis court. Such was the contempt in which the belief was held that the road would never be built. With reference to ignorance, some of the biggest offenders (in my view) have been ‘property conveyancing’ solicitors who have not alerted clients to this impediment when purchasing property which bounds Hagart-Alexander Dr [HAD]. The impediment being that they were purchasing property which bounded a charted traffic by-pass. In my capacity as a former City Councillor I consistently fielded pleas from those who purchased ‘tainted’ properties that “nobody told me”. That unfortunately is the ‘downside’ of democracy. Winston Churchill once said, “Democracy is the worst kind of governance; that is, with the exception of all other kinds of governance.” In a democracy nobody is required to hold your hand. Blaming somebody because you didn’t know is simply not a remedy. Not knowing about the purpose of the HAD corridor is a case in point. Caveat Emptor! The early part of HAD (from Gordon Rd for some 800 metres) was developed many years ago with enormously wide berms to provide for eventual road widening. This alone should have alerted property purchasers. The reason it wasn’t developed to full width was to discourage the speed of domestic/hoon traffic. Now, fast forward to around the turn of this century. Amongst much weeping and gnashing of teeth, the HAD was then developed onward to intersect with Factory Rd. Property owners in Glenbrook Drive (whose rear) bounded HAD became unreasonably hysterical because “they had been told” that the corridor would never be developed. 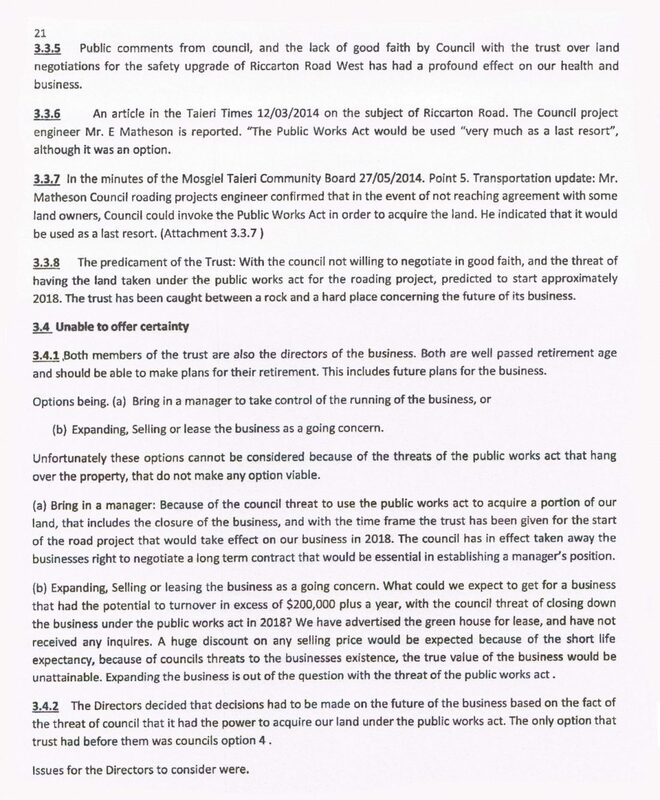 Nobody could say who told them so (probably somebody in the pub), but the People’s Document, the District Plan (to which they or their solicitor should have referred when purchasing) clearly showed the ‘roading drawings’ of the Authority’s intention. This was a classic case of people asking Council to hold the property owners’ hands, and so hysterical were their claims that the Council (quite improperly in my belief) released to them all, four metres from the road corridor to allow them to construct ‘noise abating’ bunding. This bunding has never been constructed. Then came one of the most torturous exercises of my political life. The Council was obliged to extend HAD across Factory Rd and beyond the Silverstream to Carncross St/Dukes Rd as planned. But there was the matter of rural zoned land on the seaward side of HAD and an application to rezone that land was in gestation (Mosgiel East Variation A). It was I who chaired a Working Party in year 2000 entitled ‘Heavy Vehicle Routes over Taieri Plain Working Party’, with a brief to study (not only) HAD but any route across the Taieri. To me it was a ridiculous brief. 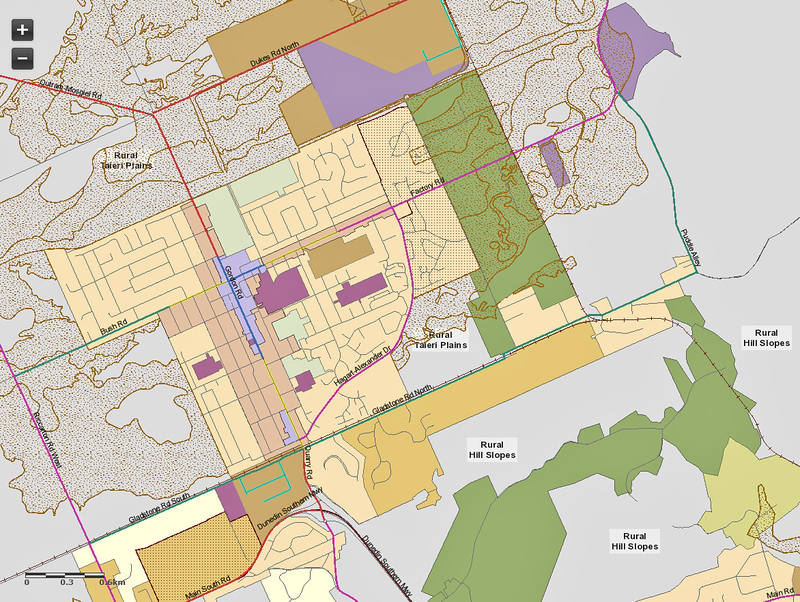 Land purchases alone for other route options were perceived to be enormous in relation to HAD where Council owned all the necessary land. The Working Party as I recall was dripping with prejudice and self interest and my memory is that the Working Party was dissolved without a comprehensible conclusion. However, in November 2001, the Working Party was reborn under the title of ‘Mosgiel By-Pass Working Party’, with Terms of Reference that removed the prejudice of the former Working Party. 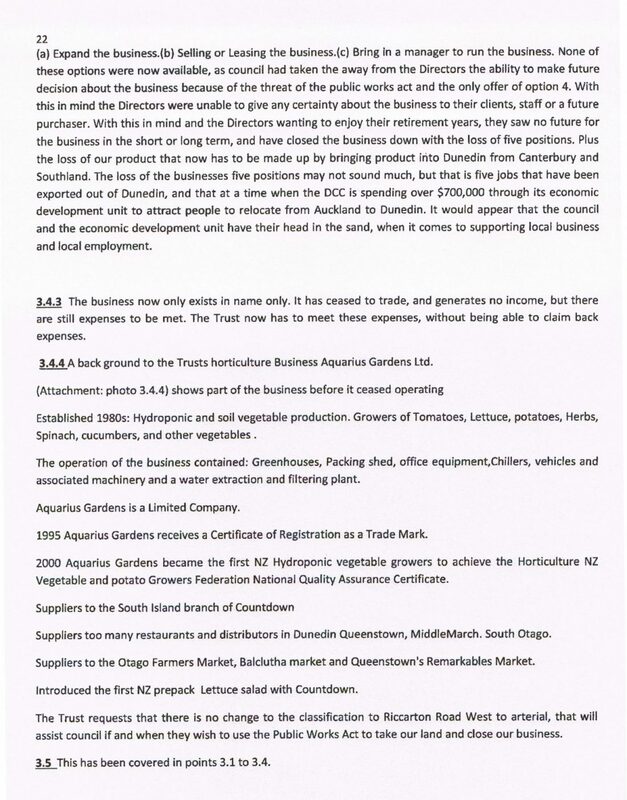 A Christchurch consultancy (Gabitees–Porter) engaged by transportation manager, the late Don Hill supported that Working Party and provided ‘in depth’ costings on all routes (Highway 87, Alanton/Outram, Riccarton Rd and HAD). Not surprisingly HAD, both economically and environmentally, came out light years ahead of the rest; largely because it was the ‘greenest’ route and Council owned the whole of the proposed corridor, and it was by far the shortest route. As an instance, and as I recall, in the case of the Riccarton Rd option, the land purchase cost to relocate that huge main trunk drainage channel across the Taieri alone (that runs parallel to Riccarton Rd), was in the vicinity of twice the cost of bridging the Silverstream for [the] HAD/Centre St extension option.